On approach, a mighty North American city slowly materialized from the haze. The roots of its steel and concrete structures were set deep in the Earth along the western edge of a Great Lake. Our destination was a small island off the waterfront, home to a bustling airport. At first blush, it might seem as though this tale occurred prior to March 2003, before Chicago's Mayor Daley ordered the wanton and illegal destruction of Merrill C. Meigs Airport. Or perhaps the inbound aircraft flew in an alternate universe where the headstrong Chicago mayor failed in his efforts to ruin a jewel of a downtown airport. The simpler answer is that we were in Ontario, Canada and about to land at Billy Bishop City Centre Airport (CYTZ) in Toronto. In this case, maybe the alternate universe hypothesis is not so far off, after all. I often think of Toronto as an alternate universe version of Chicago: cleaner, friendlier, and still blessed with an amazing waterfront airport. 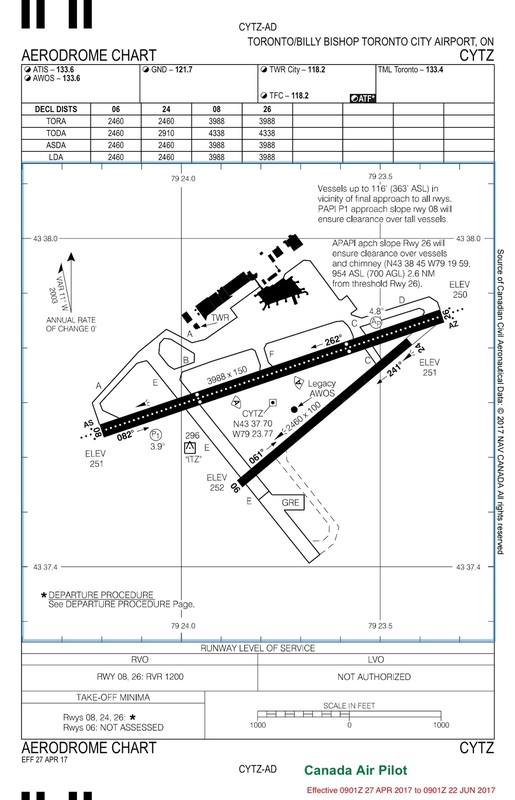 Like many pilots who grew up on Flight Simulator by subLOGIC / Microsoft, I had dreams of flying to Meigs Field, the default starting point in the software. Those dreams were rendered moot within six months of earning my pilot certificate when the airport was destroyed. As a result, I have wanted to fly into Billy Bishop Airport since the moment I first learned of its existence. As an added incentive, Toronto is a special place for me and Kristy. We started dating after a 1990 class trip to Toronto. Our last visit there was in 1995, so we are overdue for a return. 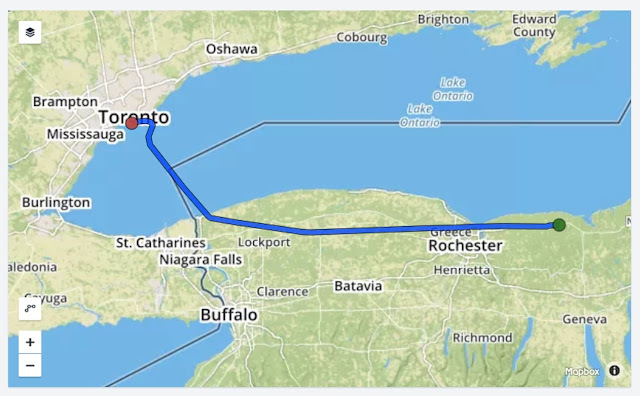 We have been flying through Canadian airspace between Buffalo and Detroit routinely for eleven years and might have landed in Canada sooner were it not for a single hurdle: a bureaucratic customs process that made me nervous. Nonetheless, I decided that 2017 would be the year we landed in Canada and I set about understanding the process one bit at a time. If those seeking to hitchhike the galaxy are advised to bring their towels, private flyers seeking to land in another country would best bring their wallets. Passports. Mine and Kristy's expired late in 2016, though The Bear's was still current. New passports were $110 apiece. This is money that would have been spent anyway. Aircraft Insurance that covered flight into Canada. Check. A Radio Station License for the airplane and a Restricted Radiotelephone Operator Permit for me. Remember when the AROW mnemonic describing the paperwork required to be on board the aircraft was actually spelled correctly with two Rs? Though these radio licenses are no longer needed when flying domestically, the FCC still requires them them for flying outside US borders. I bought both in 2006 when we first started flying through Canadian airspace, but the aircraft Radio Station License expires every ten years and mine did so on schedule in 2016. A new license cost $170. My operator's permit was still valid because they never expire (until the pilot does); an additional $65 that I did not have to spend this time around. Honestly, I struggle with these FCC requirements. By most accounts, no one ever asks to see these two documents. I cannot fathom why the FCC needs to charge me for operating my radio in another country's airspace, but hey, I'm a rule follower. CBP decal from the DTOPS (Decal and Transponder Online Procurement System) website. Decals cost $27.50 annually and are used to pay United States customs user fees. They are affixed to the exterior of the airplane within 18 inches of the egress door and must be visible when the door is open. My sticker was delivered within two weeks of ordering. An eAPIS (Electronic Advance Passenger Information System) account for filing crew and passenger manifests for flights departing and returning to the United States. 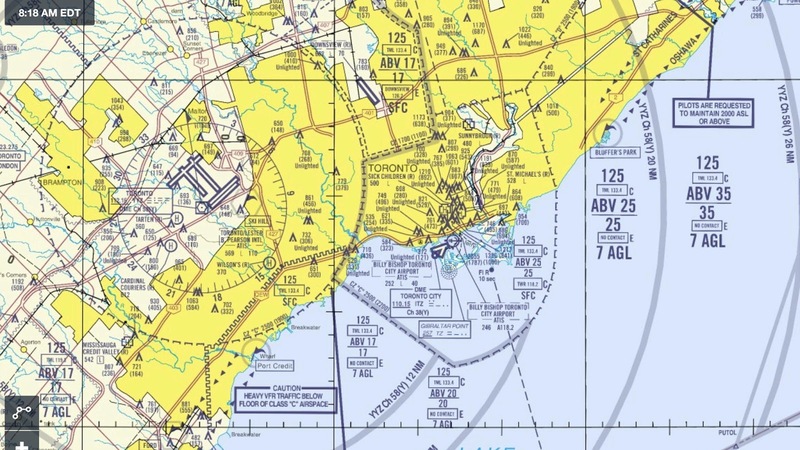 Canadian VNC (VFR Navigation Chart) showing Billy Bishop Airport. 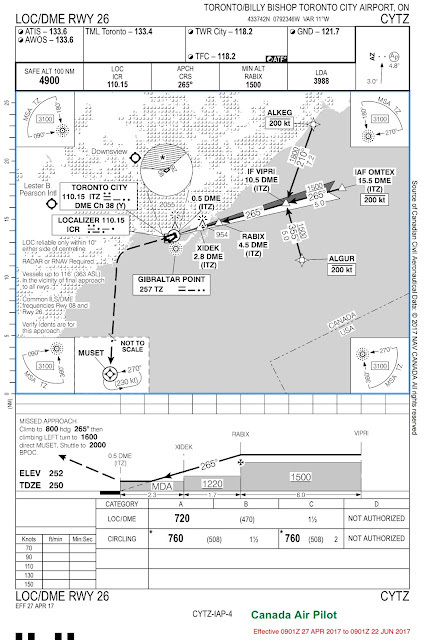 An alternate universe version of a sectional chart, but still easily interpreted by US pilots. Canadian charts. Individual documents can be purchased from NavCanada. Alternatively, ForeFlight offers an annual Canadian subscription for $100. Because we are planning another trip to Canada later in the summer, it was more cost effective for me to upgrade ForeFlight than buy all the individual documents needed for both trips. GPS database upgrades did not occur to me right away because I have used my Garmin GNS-430W in Ontario many times. When I investigated more carefully, however, I found that the only Canadian waypoints in my Jeppesen East/Central US database subscription were those that defined United States airways crossing southern Ontario (i.e., the ones I had been using along Victor 2). 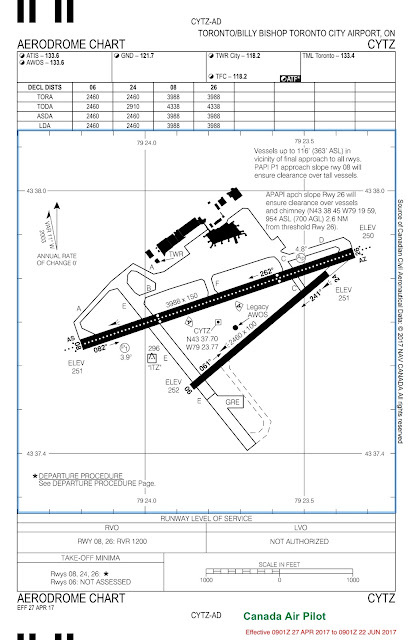 Furthermore, when I reviewed the instrument approach procedures for Billy Bishop Airport, I saw that the ILS/LOC approaches required DME, which I do not possess. Thus, I would need the GPS to fly any approaches into Billy Bishop. While ForeFlight would have sufficed for VFR navigation into Canada, it would not be adequate for IFR flight. In order to get Canadian data from Jeppesen, users need the Americas package ($550 annually), which contains all of North and South America. A single cycle subscription can be purchased for $185, but that's within $5 of the cost differential with the annual East/Central US subscription. I upgraded my subscription and paid the difference after thinking about it for a few days, trying and failing to devise a less costly work-around (other than sticking to VFR flight). Finally, I checked to make sure that my cell phone and credit cards would work in Ontario. We chose May 27-28 for our trip about a month in advance and booked a room at the Delta Toronto Hotel, a high rise glass-encased tower near the waterfront. The room could be cancelled as late as the night before if weather was not going to permit a flight. Forecasts fluctuated in the days leading up to the trip and, as late as the evening prior, I was certain that an instrument approach would be necessary to get us into Billy Bishop Airport. 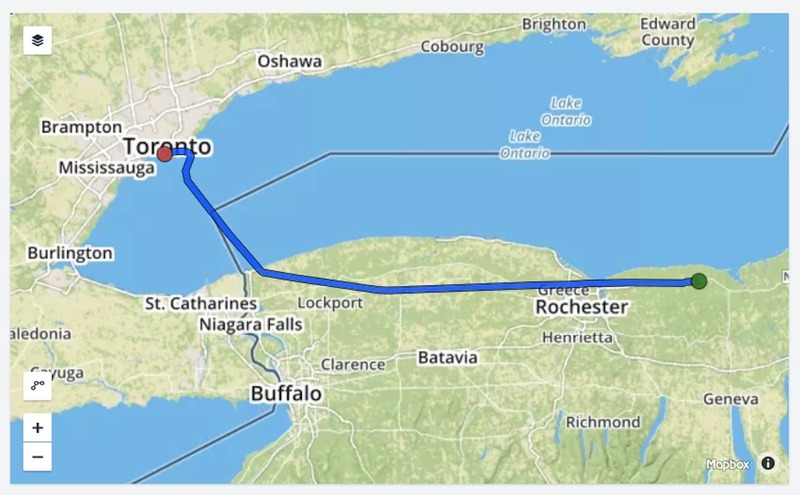 A direct route from Sodus to Toronto would have saved time, but I wanted to reduce our over-water exposure and opted to stay over the south shore of Lake Ontario for most of the flight, then cut across the narrow western end of the lake. This route seemed a fair compromise and, though there were a few minutes that would be spent beyond gliding distance of shore, the amount of time was minimal. On the morning of the flight, Sodus was low IFR in fog. We planned a 9:15 departure with a 10:30 arrival in Canada both to avoid rushing around that morning (and making mistakes while working the bureaucracy) and to allow the fog to burn off. I filed an IFR flight plan via ForeFlight the night before. Saturday morning's weather necessitated an IFR flight plan, but I would have filed IFR regardless. By filing IFR, we were guaranteed to have the squawk, active flight plan, and two-way radio contact with ATC required for border crossing. I filed our departure eAPIS manifest. An excellent user guide to APIS can be found here and I recommend reading it. eAPIS needs to be submitted no less than one hour prior to departure. Although there is no limit to how long in advance the manifest can be submitted, it makes sense to wait until the flight details (e.g., ETA, time and place of border crossing, etc.) are set. After submission, I received an email indicating that "the travelers identified within this manifest are cleared for this flight." This email should be saved and available to the pilot; I had it on my iPad. I contacted Canadian customs via their telephone reporting system (1-888-226-7277 /1-888-CANPASS). This call must be placed no less than two hours and no more than 48 hours prior to arrival. The Canadian customs officer asked for information on crew and passengers, including citizenship, passport numbers, and their expiration dates. He indicated that our estimated time of arrival needed to be accurate within 15 minutes. The first landing in Canada must be at a Canadian Airport of Entry. It is also important to arrive at the destination airport while the customs office is actually open. Billy Bishop's customs office is open seven days a week, 8:00 am to midnight, but operating hours vary by facility. We launched into a 1100' overcast after receiving our IFR clearance ("cleared as filed") over the phone. It was the first time I had received a ground clearance by phone since training for my instrument rating. My instrument scan was a little sloppy on the climb-out, but quickly tightened up as I settled in to flying in the murk. After climbing through the initial cloud layer over Sodus, we flew between layers for a few minutes before entering the clouds for much of the flight along the Lake Ontario shore. Roughly 70% of our one hour flight was in solid IMC. I had been looking forward to the sight of the Toronto skyline on approach and began to wonder how much of the waterfront we would actually see on arrival. Still, it felt great to get actual IMC time again with impunity. Low clouds and concerns about icing had already led me to cancel three flights during the relatively cold spring of 2017. As usual, I monitored Guard on 121.5 MHz. During this time, we were treated to several loud outbursts addressed to someone named Jimmy and a couple of audio samples of Chewbacca growling, the latter of which is evidently a thing now. The Bear was amused and the adults were unimpressed. I was already familiar with a lot of Canadian ATC phraseology differences: "radar identified" instead of "radar contact", "decimal" instead of "point" when providing frequencies, and radar facilities described as 'Terminal" rather than "Approach". For example, "Cherokee Four Eight One, radar identified, contact Toronto Terminal on one three three decimal four." After years of talking to Canadian controllers, I felt right at home when Buffalo transferred me to Toronto Center. Toronto Center offered to turn us direct to City Centre (as ATC refers to Billy Bishop Airport) just east of the Niagara River and HWYYN intersection (wasn't that a horse in the Chronicles of Narnia?). This was a slight alteration from my filed route, but I decided that the additional time over water would be insignificant. 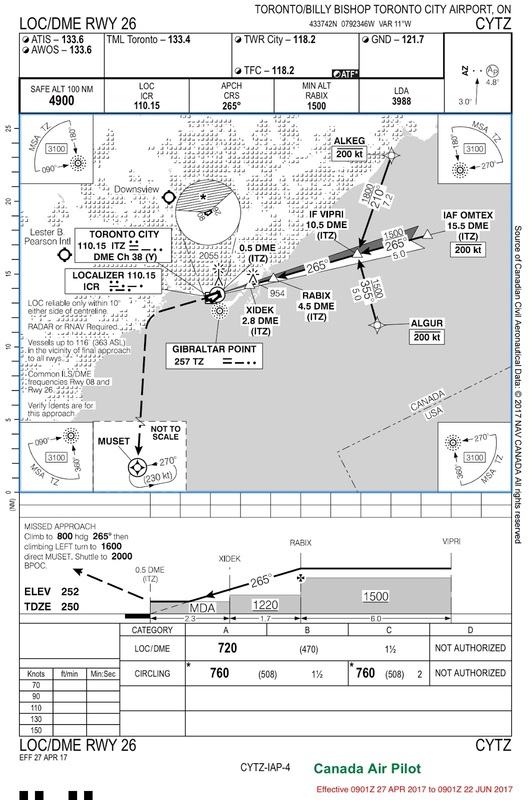 While planning, I considered the scenario of a missed approach at Billy Bishop if the weather was below minimums for the available instrument approaches. After all, customs was expecting us at Billy Bishop at 10:30 am and flying into an alternate Canadian airport would not do. We carried 5.5 hours of fuel on board, so I filed Rochester and Sodus as alternates. If we could not get into Billy Bishop that morning, we would simply return home. Without a landing on Canadian soil, we would not need to clear customs to re-enter the United States. 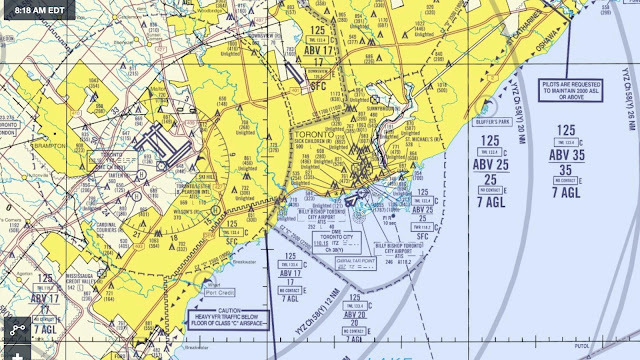 Before going feet wet over Lake Ontario, I checked Billy Bishop's ATIS: 9 mile visibility, ceiling at 5500 feet, visual approach runway 26 in use. My concerns about the weather being too low for landing vanished. As we crossed the lake, Toronto emerged from the gloom, a broken layer hovering above as advertised by the ATIS. Billy Bishop Airport was busy that morning. We were number four to land and vectored for a visual approach with a six mile final. According to the airport website, Billy Bishop is the 9th busiest airport in Canada. As we passed this tall smoke stack in the departure corridor for runway 8, it was obvious why departures from that runway required a higher than standard climb rate. We would find ourselves climbing directly toward it the very next day. The city finally emerged from the haze, popping into clear focus as we paralleled the shoreline on a long final approach for runway 26. I can say without hyperbole that I greased Warrior 481 onto our first foreign runway. We slowed to a stop, exited on taxiway Foxtrot, and held short for conflicting traffic (a Porter twin turboprop and a Cessna) before taxiing straight ahead to the Porter ramp where we shut down and called Canadian customs via the CANPASS telephone number. Crews and passengers of arriving aircraft are required to remain within their airplanes until cleared by customs. We had a brief moment of panic when our cell phones could not find signal, but they eventually woke up and locked on. I had a brief discussion with Canadian customs during which time I was issued a confirmation number and cleared onto Canadian soil. No one personally came to the airplane and, from my research, this appears to be very common for Canadian customs. 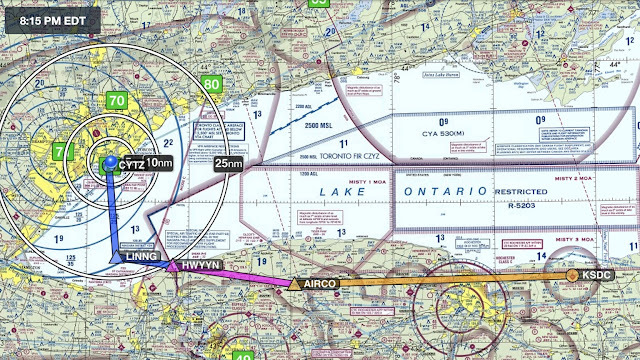 GPS ground track from Sodus to Toronto plotted by ForeFlight. We had succeeded! No ATC deviations or international incidents! The mainland is reachable from the island airport either by ferry or a tunnel that runs under Lake Ontario. We took the tunnel and, suddenly, Kristy and I found ourselves back in Toronto, the city we'd first visited as college Freshmen years before. Much to The Bear's consternation, the old private jokes began zipping back and forth. Our college friends would have found it hilarious. The Bear did not. We reached the Delta Toronto Hotel after a brisk walk along the waterfront. Our room was spacious, modern, and well-appointed. As The Bear was quick to note, it was the exact opposite of the last hotel room we had in New York City. She is a worldly Bear, after all. Are Alex or Geddy Home? Toronto is a vibrant city with a lot to see and do. Unfortunately, The Bear's numero uno pick for family activity was the Toronto Zoo, which we discovered to be closed indefinitely owing to a strike. There were many tears over this, but we carried on nonetheless. The CN Tower, Toronto's most unmistakable landmark, was next to our hotel. At 1815 feet high, it was world's tallest free-standing structure when completed in 1976 and retained that distinction until 2010. In 1995, the American Society of Civil Engineers declared it one of the Seven Wonders of the Modern World along with the Empire State Building and the Panama Canal. In fact, the tower is so massive and distinctive, it is practically visible everywhere one looks. The observation deck provides a grand view of the city. While maybe providing effective mitigation against the extremely clumsy or suicidal, this screen did little to enhance the view. The last time I stood on the outdoor observation platform was on a cold, February night in 1990 while the wind howled and the footing was treacherous on the icy deck. The Sheraton Centre, where Kristy and I stayed with our classmates on that fateful college trip, was the site of the infamous "wicked butter" incident. The hotel was close to Yonge Street where my friends and I explored multiple record stores, including the iconic flagship store of Sam the Record Man. The store was visible from blocks away because of a massive facade featuring two vinyl discs rendered in flashing neon. "Vertigo: a sensation of whirling and loss of balance, associated particularly with looking down from a great height..." (citation: Google). The glass floor was installed in 1994. Egad. The thought of standing on this glass floor immediately liquefied my insides. The CN Tower also afforded a great view of Billy Bishop City Center Airport. To my surprise, my photos from the CN Tower caught Porter in the act of repositioning Warrior 481. I inspected the nose wheel fairing carefully the next day. There were no scuffs, so Porter gets high marks from me for their handling of my airplane. "Where are the dinosaurs?" Kristy set up The Bear to mock me and my friends for mistaking Toronto's Parliament Building for the Royal Ontario Museum and bursting into the quiet facility demanding to know where the dinosaurs were. We probably reinforced some people's stereotypes of Americans being loud and crass that day. Eaton Centre was the biggest mall I'd ever seen in 1990. It probably still is. It was just so...vertical. Dinner was at The Loose Moose, a popular local pub around the corner from our hotel and one that we discovered years ago as college students. We ended the evening with a swim in the Delta Toronto's fourth floor pool. Windows on two and a half sides showed the cityscape around us, dominated by the massive pylon supporting the CN Tower. The Bear was in little swimmer heaven. Next time you go, it is worth the expense (and it is foolishly expensive) to have lunch in the CN Tower's revolving restaurant. I agree. Writing this post really highlighted for me how much more work I had to do to satisfy the US than Canada.